Rotary Vacuum Feedthrough - National Electrostatics Corp. The NEC magnetic coupled rotary feedthrough is ideal for applications requiring the transmission of high speed rotary motion into ultra-high vacuum environments. It is used to measure beam cross sectional shape. 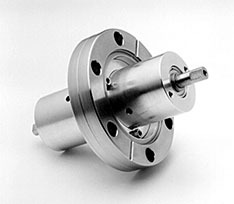 The NEC rotary feedthrough consists of two magnets on opposite sides of a stainless steel plate. Ultra high vacuum compatible ball bearings supply support for a rotating shaft in the vacuum volume. There is no physical break across the vacuum barrier. It is designed to support a torque of 10 in-oz. This feedthrough mechanism is very similar to the rotary feedthrough used on the NEC Beam Profile Monitor (BPM), which is used to turn a wire through an ion beam.